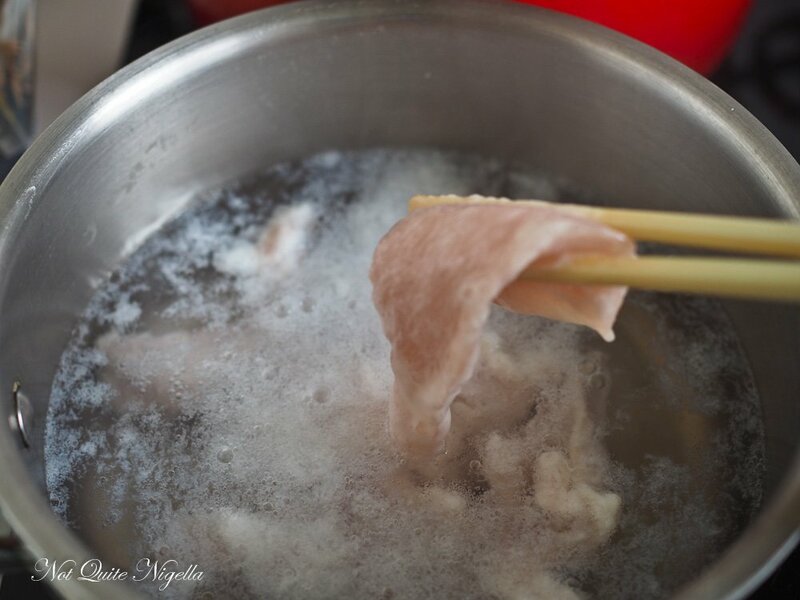 Velveting meat is a Chinese cooking technique used in Chinese restaurants. 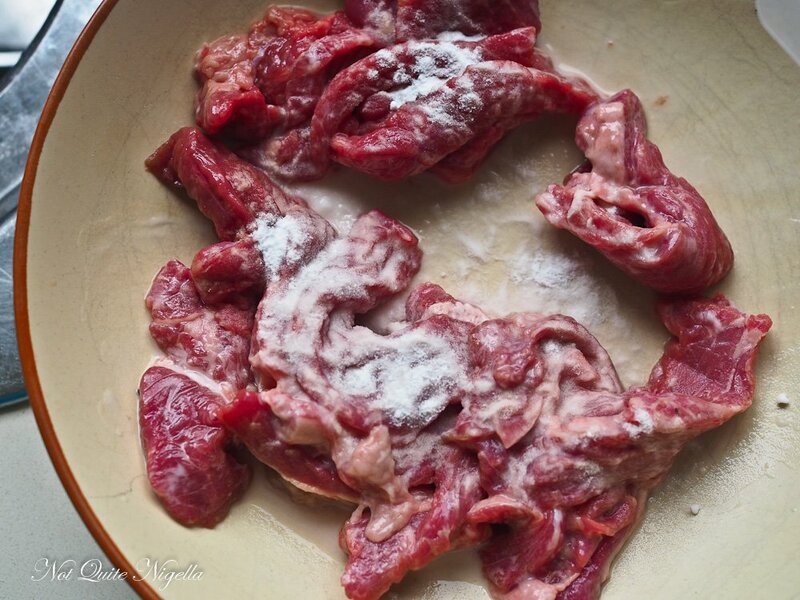 The process of velveting is one where you marinate raw meat in cornstarch and egg white or bicarbonate of soda to give it a soft, slippery, velvety texture. For years I watched my mother "velvet" beef and chicken neither of us knowing what the term was but happy that the beef and chicken that we ate was soft in texture-I guess taking it for granted. It was only when I saw Rachel's recipe for velvet chicken that it ticked over in my head that my mother used this method and that it was called velveting! 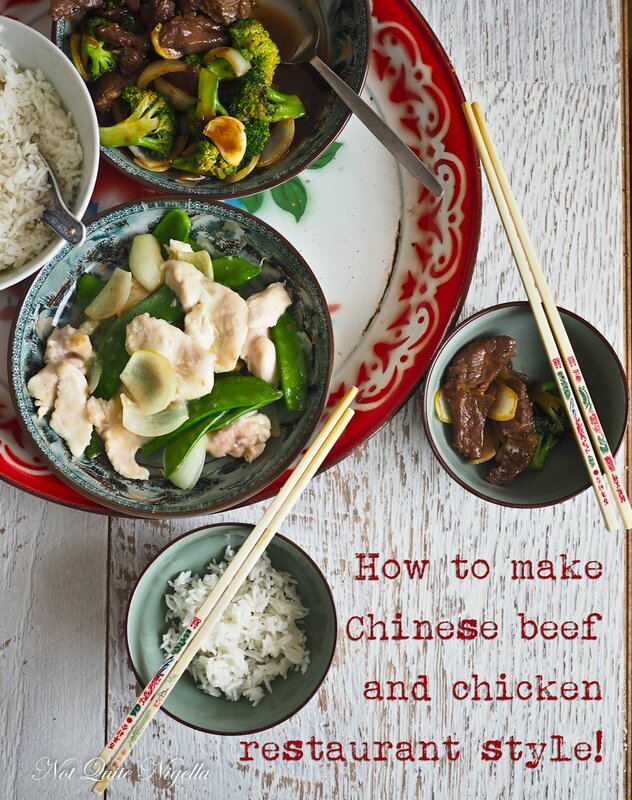 About once in a while I get an email from a Dear Reader asking me how to get the distinctive soft texture of meat found at Chinese restaurants. This usually follows after I share one of my mother's recipes. Being not very clever I didn't put two and two together and realise that this was something that you might all find useful. But let me change that situation today. Velveting can be done a lot of different ways but today I'm going to show you how my mother does it using two different methods. When I asked her about velveting, the term drew a blank look. It was something that she picked up from a recipe book decades ago and there was no name for it. It was just one step in the recipe. 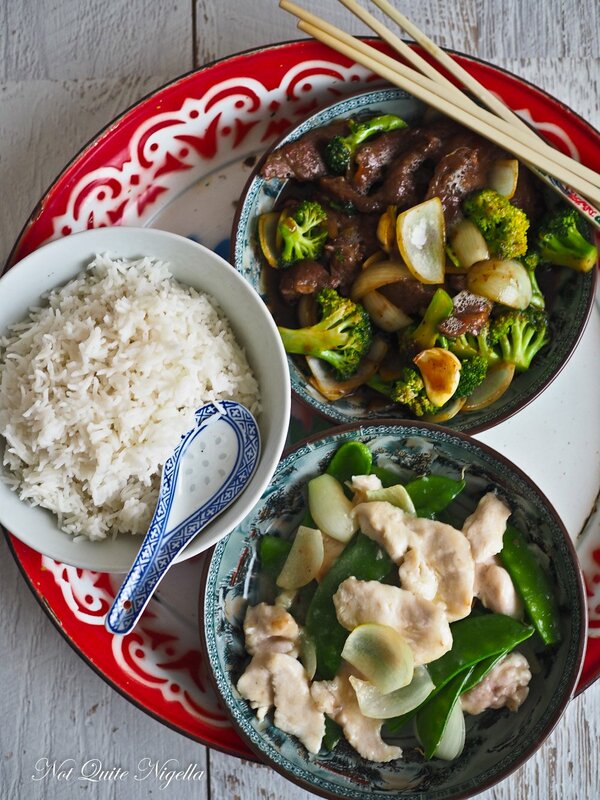 But now people are cooking more Chinese food at home and trying to replicate their favourite take out dishes without the addition of MSG or additives. And the texture of velveted meat is so distinctive - and world's apart if no velveting is employed. 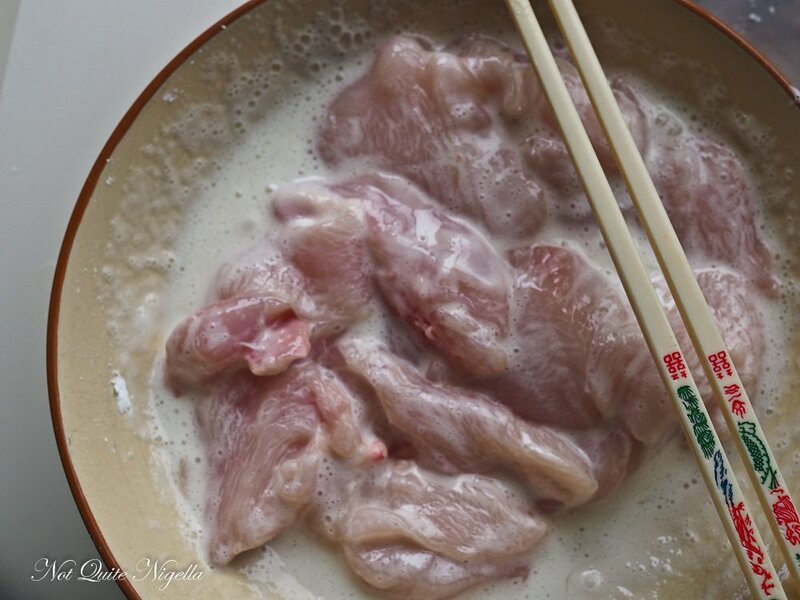 You can turn chicken breast from a dryish "rough" texture to a soft, moist, slippery meat. The good news is that velveting chicken is easy but velveting beef is even easier still! All you do is slice the beef against the grain and then marinate it in bicarb for 20 minutes before washing the bicarb off thoroughly (make sure to do this because you don't want the bicarb taste). For chicken breast you mix it with egg white, cornstarch and bicarb and then quickly simmer it in water. Both method tenderise the meat quickly. And if you are really pressed for time and effort, the beef method using just the bicarb also works nicely for chicken too, just marinate it for 7-8 minutes. I was in Canberra the past two weekends ago doing a bit of research for two upcoming Canberra posts. One day I was eating lunch by myself at a hotel and I was struck by how different the conversations are in the capital. While I waited for my food I overheard a three generational family having a conversation. A man was telling a story to two women and a young boy. The topics ranged from human trafficking, slavery and Afghanistan. It was all very adult and fascinating (I love these types of conversations and I was so engrossed in it I almost wanted to join in). "And then that was all just a moral cover," he said. "What's moral cover?" I said to myself. "What's moral cover?" said the young boy. Phew, I didn't have to interrupt their conversation and let them know that yes I was listening (although anyone watching closely would have known it). He explained that it was a term for when you do something bad but find a moral reason for doing it. Therefore getting a moral cover or an excuse for doing something. I felt smarter just for sitting near them and learning a new term. So tell me Dear Reader, have you ever heard of velveting meat before? Or the term moral cover? Do you tenderise your meat usually before cooking it? Have you got another method? Step 1 - Slice the beef against the grain - this helps the velveting process as it gets into the fibres better. Make sure to remove the white sinewy bits as they will not soften and will make the meat chewy. Place the beef slices a bowl and toss with the bicarb and water until the beef pieces are coated. Cover and refrigerate for 15-20 minutes. Step 2 - Have all of the other ingredients ready because this cooks very quickly. Rinse the bicarb from the meat very well (feel the beef and if there are any grains of bicarb keep rinsing it under running water) and pat dry with a couple of paper towels. Place a large wok or pan on high heat and add some oil. Fry the beef browning it until almost cooked through. Remove from the pan and set aside. Add some more oil and add the onion and garlic and fry until soft and translucent. Add the broccoli and fry for about 30 seconds. 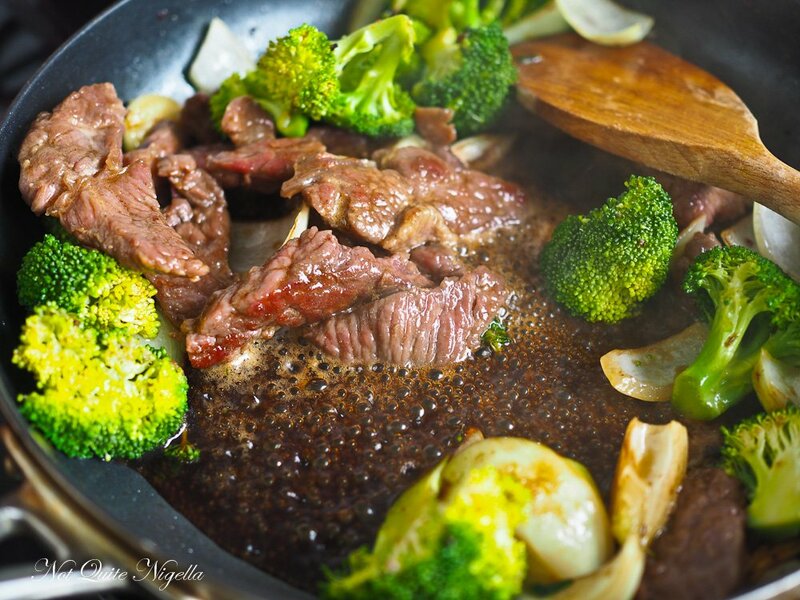 Add the soy sauce and sugar and the beef and toss quickly and briefly until the beef is done. Push aside the beef and vegetables to get to the sauce and add the cornflour and water mixture to the sauce to thicken. Toss the sauce over the beef and vegetables and serve. Step 1 - Slice the chicken breast thinly against the grain into small, thin strips. I think my slices were too thick so I'd cut the breast in half horizontally first. 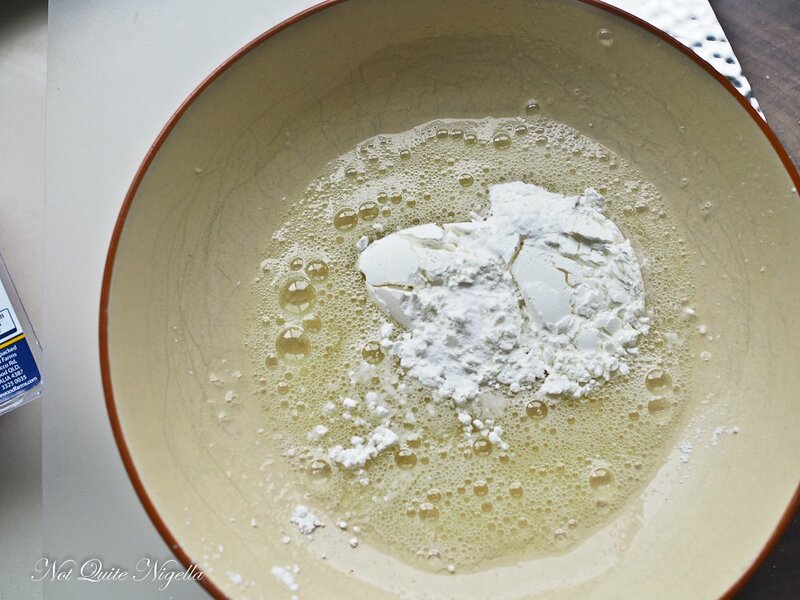 Whisk the egg white a little until foamy and then whisk in the bicarb and cornflour. Coat the chicken in this mixture. Cover and place in the fridge for 30 minutes. Step 2 - Heat a large saucepan of water to boil and add the chicken in one piece at a time so that it doesn't stick together. Simmer for about 45 seconds and then drain in a sieve. Step 3 - Heat a frypan with oil and add the ginger, garlic and onion and fry. Add the snow peas and fry for about 30 seconds and then add the chicken stock, soy sauce and chicken. Cook for about a minute or two until the chicken is cooked through. Push aside the chicken and snow peas to get to the sauce and add half of the cornflour and water mixture to the sauce to thicken adding more if necessary. Toss the sauce over the chicken and vegetables and serve.